It is shown that nonlinear terms in the equations for gravitons in the background of curved space-time of the expanding Universe can solve the problem of the negative effective mass squared, formally arising in the linear approximation for gravitons. Similarly to the well-known spontaneous symmetry breaking in the Goldstone model, one must take another vacuum, so that a nonzero vacuum expectation value of the quantized graviton field leads to a change in the graviton spectrum. There appear two graviton fields, one with positive mass, another with zero mass. 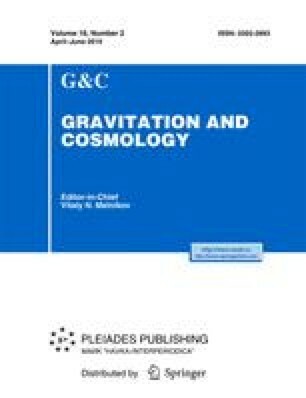 The energy density and the density of particles created by gravitation of the expanding Universe are calculated for some special cases of the scale factor. Numerical results are obtained for the case of a dust universe.